On the last track we discussed behavioral contracts. I described three steps to writing a contract. These three steps are specificity as to what is required from each personality, determining the consequences for contract violations, and length and termination of contracts. On this track we will discuss promoting internal communication. Of the basic treatment goals regarding DID clients, fostering and promoting internal communication is one of the first steps your client will take toward integration and unification of his or her personality system. Therefore, let’s examine three of Putnam's techniques you can use for promoting internal communication with your DID client. Three techniques for promoting internal communication are therapist as a go-between, the bulletin board, and internal conversations. Do you find that internal communication is necessary for alter personalities to begin to share affects and memories? The first technique is simply for the therapist to act as a "go-between." This entails listening to one alter and then relating what that alter said to whoever else in the system needs to hear it. Often this is the only way to initiate a dialogue between the host and other alters early in the therapy. However it is frequently difficult for a therapist to maintain a neutral stance while relaying hostile and vindictive comments back and forth. Colleagues of mine have fallen into these internal splits. Would you agree that some therapists may feel forced to support one side against the other? In the beginning, however, acting as a go-between may be the only way to initiate a dialogue within the system. In my practice I try to remain neutral and to convey information as accurately as possible. With Alan, I continually suggested that the personalities have the capacity to talk directly with one another if they wished. Alan was resistant to participating in internal communications. Alan stated, "…Even if I could talk with the other, which I can’t, I wouldn’t want to!" I felt that this was part of Alan’s denial process regarding his diagnosis of dissociative identity disorder. Over time, Alan’s denial and resistance declined. I stated, "Think whatever you wish to say to the others and listen internally for an answer." Eventually Alan began a process of internal communication. Think of your Alan. How might you ease him or her into internal communications? The next level of communication technique that I introduce to a system is what I call the ‘bulletin board.’ The principle is simply that the client has a place where personalities can ‘post’ messages for each other or the system as a whole. The actual medium is up to the client. Most clients simply use a notebook that can be carried easily. The therapist then instructs personalities to write messages in the notebook to one another. The messages should have a heading and should be dated and signed. For example, Vaughn was instructed to write his messages with a heading addressing whichever personalities he wanted to communicate with. I find that the dates and sequential order of the messages allow the client to track the dialogues chronologically. This helps provide a form of continuity that you may find helpful in later sessions. As with the previous technique, however, the host may resist. Alan resisted at first because he did not like finding mysteriously written messages that provided tangible evidence of Vaughn’s existence. Alan also stated, "Some of the messages seem disturbing, like these ‘alters’ are trying to get me to believe they can read my thoughts. I don’t believe half of the messages that I get." How might you have responded to Alan? I stated, "I know how you feel. Of course you’re not going to sympathize with any of those messages. But if you consider persisting in this experiment, it could be productive. Just don’t think you have to assume responsibility for the content of the messages. And if you start to feel comfortable, you might post notices about your needs and schedule." I also encouraged Alan to check the notebook several times a day, even when he was sure nothing had been written in it. You might find, as I did with Alan, that host resistance can be the major obstacle regarding internal communications. 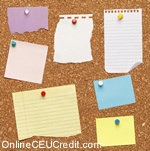 The Bulletin Board may need to be restarted several times before it takes hold and becomes a useful tool for promoting internal communication. In addition to the therapist acting as a "go-between and The Bulletin Board, a third method for internal communication is internal conversation. Of course internal conversation is the preferable form of internal communication and is ultimately an early treatment goal. However, you may find that internal conversation generally does not take place until later in the treatment process. I have found that the capacity for internal conversations is likely present in every DID client’s personality system, but the difficulty lies in promoting it. The process of developing internal conversations changes the hearing of voices from a frightening or distracting experience to a productive and rewarding activity. For example, Alan had stated early in his treatment, "When I hear voices it makes me think I’m going crazy! I just try to block them out!" My treatment goal was to transform these voices to useful internal conversations. Think of your Alan. How might you promote internal conversation with your DID client? Could the therapist acting as a "go-between and The Bulletin Board techniques help your client to begin productive internal conversations? On this track we have discussed promoting internal communication. Three techniques for promoting internal communication are therapist as a go-between, the bulletin board, and internal conversations. On the next track we will discuss conversation topics and internal decision making. Regarding conversation topics, we’ll look at basing initial topics upon needs and secondary topics. The next track will also provide several techniques you can implement with your client to foster productive internal decision making skills. What are three techniques for promoting internal communication with a DID client? To select and enter your answer go to CEU Answer Booklet.